Once upon a time, I was a completely into the mystique of Italian cycling products. I mean, I chugged the KoolAid and asked for seconds. And really, it was an easy time to fall in love with that old world romance. 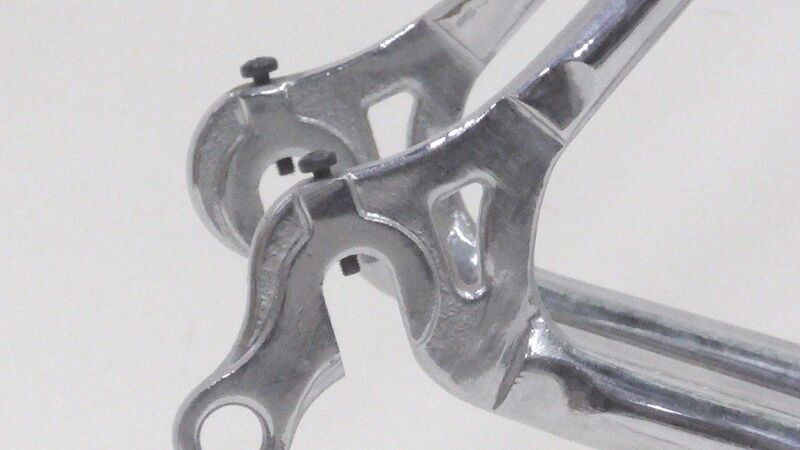 I scraped together every dollar I could to get a titanium Colnago…which was a piece of crap. I was pretty disillusioned. I felt like I had paid to for premium tickets to the opera and found discovered that behind the high price and self-aggrandizement, the performance was amateurish, or worse, apathetic. I sold the Colnago at a steep loss and counted myself lucky to be rid of it. 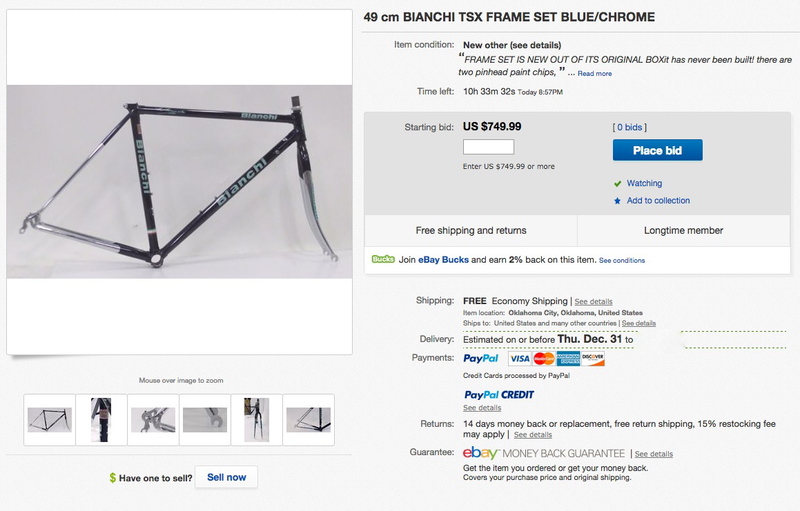 With the leftover coin, I settled to purchase a lugged steel Bianchi…which was one of the best things I’ve ever bought. The Bianchi name was respectable but not considered exotic; likewise the construction and finish of this particular example would not be setting any new standards. And yet the bike proved to be balanced and dependable, as versatile tool in a hairball crit as during an endless day of training. The Bianchi was a different kind of Italian fascination, less pretentious, a little more real. My Bianchi is a 1996 EL/OS in traditional celeste paint scheme, made in Milan. If the bike design can be faulted, it’s that the tyre clearance adheres to the fashion of the times. Forget about fitting anything bigger than a 23mm tyre. But I like the bike so much I have thought about buying another if I had the bike room the size of a small aircraft hanger and the money to fill it with nice bikes. My Bianchi currently has modern SRAM components on it; I thought it would be fun to build another one up with all retro components. 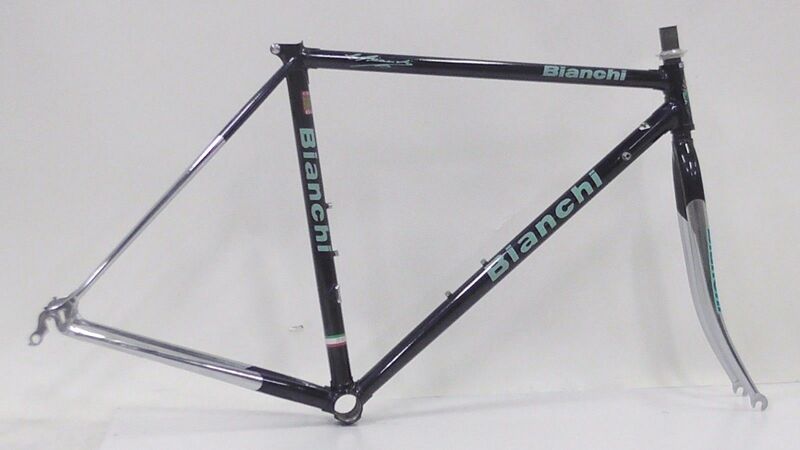 So occasionally I look for Bianchi framesets from the same era. 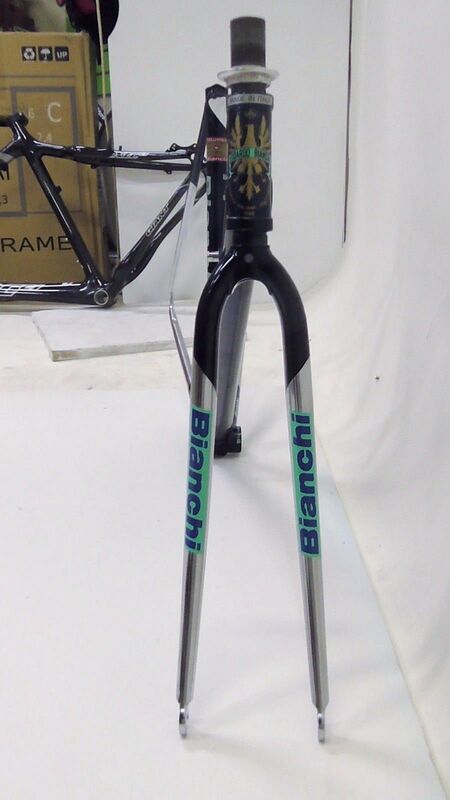 That’s how I found this 49cm Bianchi TSX/UL. I think that this particular example might be a 1995 model, judging by its paint. That dark, liquid blue was sometimes called 110 Blue, as it was also used on the 110th Anniversary titanium framesets that year. I could be wrong about the year, but the TSX/UL had the same geometry as my bike. The tubing was just a little unusual: oversize downtube that was ovalized at the bottom bracket lug but a standard 1” top tube. I can see some minor differences though, like a different seat lug and the addition of a chainstay bridge from my bike. I think that this new-old-stock frameset is a great deal at $750. If memory serves, that is the exact retail price from 20years ago. 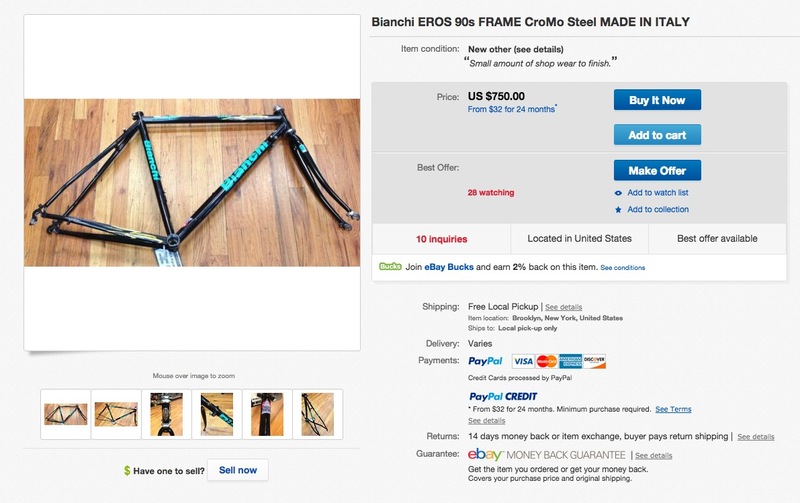 It’s possible that my affinity towards those Bianchi framesets similar to mine biases my opinion on the value of the bike, but I can’t see how that price isn’t reasonable considering that someone else is trying to sell a Bianchi Eros frameset for the same amount. The Eros was a much cheaper bike, maybe $750 complete back then. And despite what the listing says about it being a new, unused item, that frameset looks like it has at least been assembled. These days my Bianchi EL/OS doesn’t get ridden in the rain much, though it once served as my rain bike when I lived in Florida. Rain bikes in Florida don’t need fenders because the rain comes at you sideways like a fire hose; fenders don’t help against that. A Florida rain bike needs to be sure-footed in a wet crit. Yet in a sense, I do ride the Bianchi on rainy days though, since I have it mounted on a trainer. I do take extra care to wipe off the sweat. I own two lugged steel road bikes these days. The Bianchi that I’ll probably always keep, and a 1983 Sannino. The Sannino was already battered when it came to me, and honestly the paint would have been crap from the beginning. The Sannino has somewhat unusual geometry and vintage components, but I can wedge 700x30mm tyres into the frame and fork. It’s nice to have different tools on hand for whatever the job calls for. The Sannino is currently serving as a test jig for the Schwalbe S-One tyre, a tubeless clincher made to conquer the spring classics.